Whether you’re using Exchange Online, Hosted Exchange or any of the versions of Exchange Server On-Premises (Exchange 2010, Exchange 2013, or the latest Exchange 2016), you need to monitor the systems performance, uptime and availability. And the network that Exchange depends on. No other tools are as easy to deploy with as much coverage no matter what version of Exchange you’re using. Exchange perfmon counters are fine for diagnosing a server, but you need to know about the health of the entire system end-to-end. Before problems impact your business. Get notified of errors, slow downs and emergencies in real-time with automatically configured and calibrated alarms as you deploy. Integrate notifications out of the box. Monitor Exchange from inside your firewall or outside on one of our Public Sites. 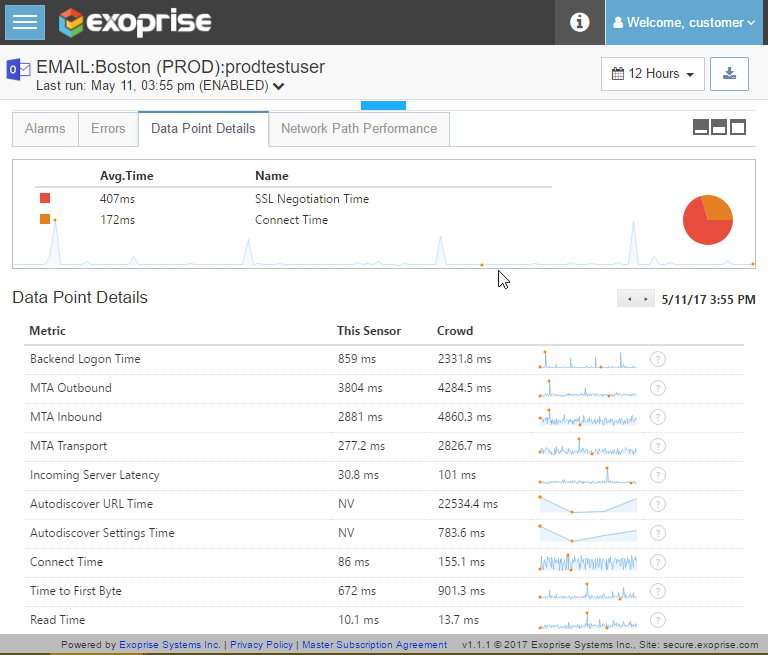 Get a 360° view of your Exchange Servers, mail flow and Exchange connectivity. Deploys in minutes, watches your back for problems that may crop up. CloudReady is a cloud-driven service that deploys behind the firewall with no servers to setup, no databases to maintain. Setup Private Sites anywhere in your network, alongside any workload. 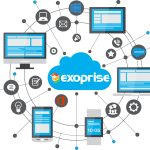 Deploy sensors for monitoring any version of Exchange. CloudReady Private Sites have been developed with 100’s of man-years worth of security expertise. The agent is self-healing & self-updating with wizard driven setup to help you manage the secure public/private key-pairs. Works through any proxy, on-premise or in the cloud. Full support for testing Single Sign-On providers like ADFS, Okta, Azure AD and more. End-to-end synthetic tests of protocols like MAPI and ActiveSync to establish baselines before, during and after Exchange upgrades or moves. 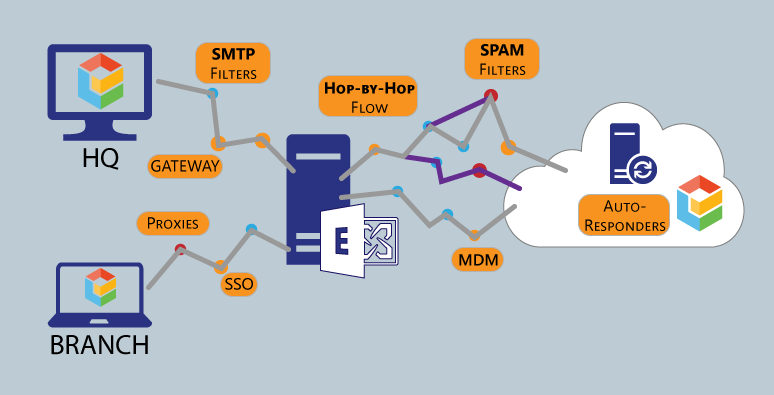 Using an Exchange ActiveSync MDM vendor? Monitor their performance & uptime for troubleshooting and long-term Service Level/SLA violations. Passive counter collection is great for digging into the details but synthetic tests let you know about a problem before it impacts your business. Login Time – For all email sensors, the time it takes to connect and authorize with the service is captured. UI Login Time – For browser based email tests like for Outlook Web App or Gmail, the time to sign in via the Web interface is captured. Autodiscover URL Time – Autodiscovers are periodically performed and when required. The time and steps for Autodiscover are captured. Especially in Hybrid environments this can sometimes be the source of bugs and slowdowns if not configured correctly. Autodiscover Settings Time – Retrieving the mailbox settings is a separate Autodiscover step and its timing is captured. DNS Lookup Time – DNS for connectivity is critical for all network services. DNS lookups are measured for the sensors and captured. Connect Time – For all network connections, for most sensors, CloudReady captures the low-level network connection time. This value often reflects network health and latency betwene the sensor and the service like Office 365. Time to First Byte (TTFB) – Time to first byte is a network metric typically used throughout web performance monitoring but captured as part of the CloudReady Email and Exchange Sensors as well. This metric is useful for determining when the server might be slower. Time to First Byte reflects how long the server takes to respond (on average for the sensor run) to each of the requests sent to the server. 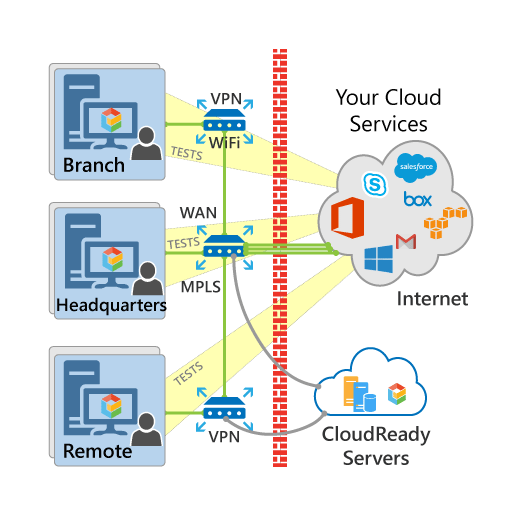 Proxy Connect Time – A separate measurement is recorded for CloudReady sensors that are behind proxies. Since most proxies are transparent, this metric is unique and helpful for diagnosing when proxies may be the cause of slowdowns for Email connectivity. SSL Negotiate Time – CloudReady records the amount of time that the initial SSL negotiation takes. Longer negotiate times are usually indicative of network congestion since the initial negotiations have many round-trips. 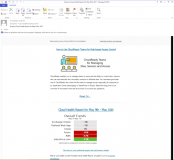 MTA Outbound – The time it takes to send an email to our CloudReady auto-responders. This metric measures outbound queue and transfer performance. MTA stands for message-transfer-agent and is responsible for the transmission of email between servers. MTA Inbound – The total time it takes to reply to an email from our auto-responders to the inbox. This metric measures inbound queue performance. 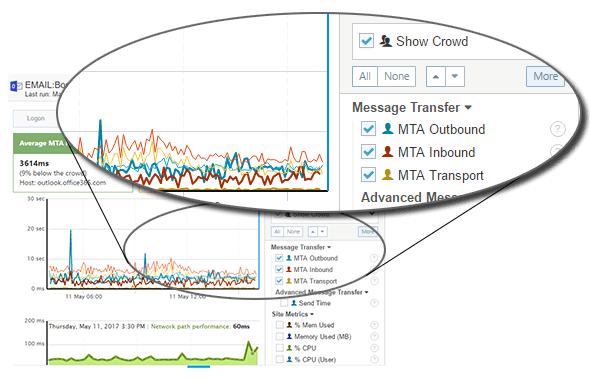 MTA Transport – The time it takes for a reply to reach the inbound MTA servers. This metric measures inbound transport performance and is a subset of the MTA Inbound time as reported by processing servers. ActiveSync Logon Time – For the ActiveSync sensors, Login Time includes time spend synchronizing initial folders after authorization. Provision Time – ActiveSync sensors periodically check and re-provision their devices similar to the way a periodic Autodiscover is performed. Subscribe to our weekly Cloud Health Report to see how Office 365 performed last week. Measured from 1000’s of locations throughout the world. 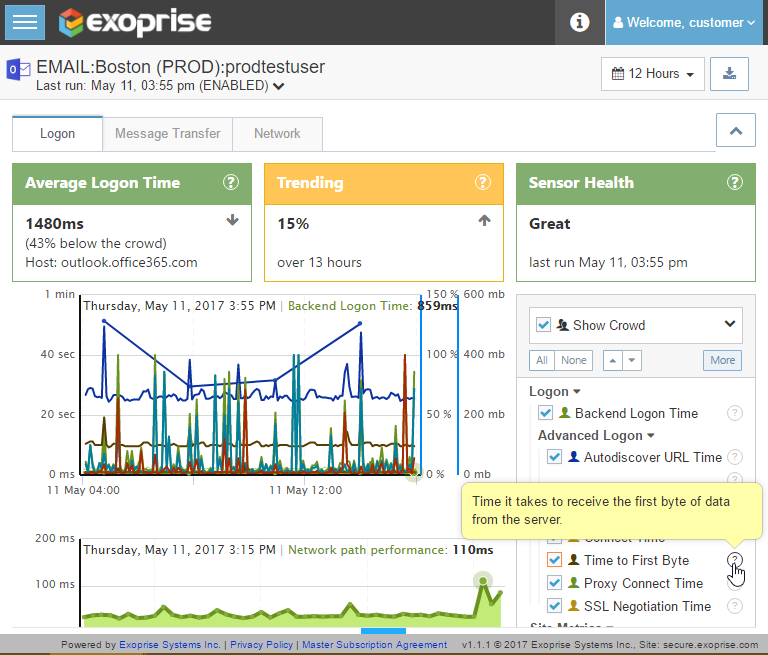 Read more about Exchange and Office 365 Exchange Online monitoring. Take it with you, share it, print it, frame it – you name it.